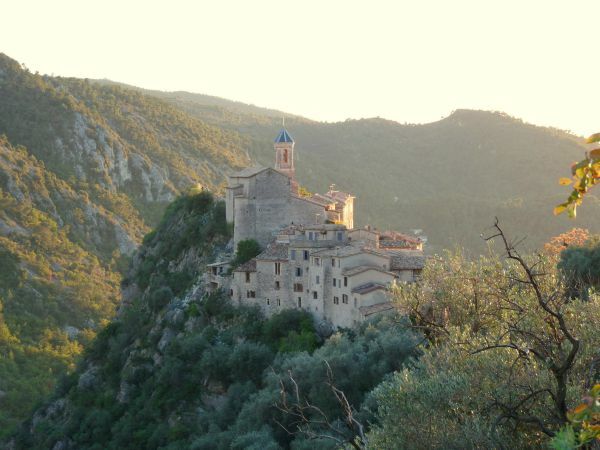 The Alpes-Maritimes department in south-east France, including the world famous Côte d’Azur, is home to several hundred medieval hill villages, fortified towns and ruined iron age camps, too many to list, so here I’m sharing my choice of 13 of the best hill villages near Nice. 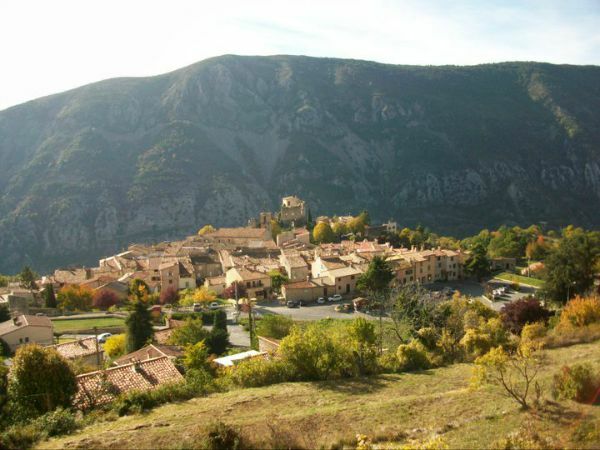 The “villages perchés” vary from little more than a pile of ruins to perfectly renovated sophisticated small towns, some are now the ancient centre of a modern town, others are gloriously isolated deep in the countryside. Some are almost at sea level others over 1500 m high in the mountains. What they all have in common though is that they are built in strategic locations, to protect themselves from invasion, often on rocky outcrops or cliff faces; places hard to access and easy to defend. They tend to centre around a church and castle at the top with winding narrow cobbled alleyways, twisting down to the ramparts. These lanes are sometimes covered, forming tunnels, they often turn into steps and are nearly always far too narrow for cars. They were built for donkeys, horses and carts but nothing any bigger which makes for an interesting spectacle when a modern day resident has a large piece of furniture delivered! (Surprisingly they are very nearly all still inhabited). 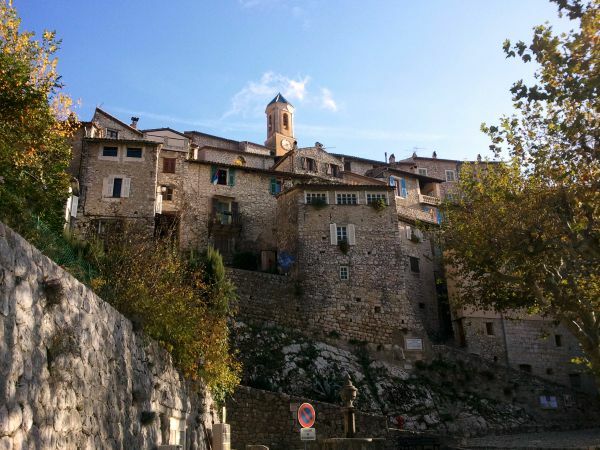 I don’t suppose I’ll ever get to all the hill villages in the area, especially when you consider there are plenty more in the neighbouring Var department and across the Italian border in Liguria, but I’ve visited plenty and love discovering new ones. Here’s my choice of the 13 best easily reached from Nice and surrounding towns (in no particular order), with a brief description. Gréolières (not to be confused with Gréolières les Neiges, the ski resort nearby) is a small, easily accessed hill village as it isn’t too steep. It lies dramatically on the edge of a cliff over looking the Loup river. The drive to it and just a bit further past it towards the ski area is spectacular and one of the main reasons to go. The village, which has a handful of restaurants, is unpretentious, existing for locals rather than the tourist market It’s extra pretty in the snow which it regularly gets during the winter. Gourdon is the real jaw dropper of the region. It is practically carved out of the rock at 760 m altitude but surprisingly within its walls it has a castle (where Queen Victoria once stayed) and a garden designed by Le Nôtre (he of Versailles fame no less). Unfortunately the castle is no longer open to the public but a wander around the tiny village is worth it for the views alone. As it’s only 20 minutes from Lou Messugo I take all our visiting friends here and pose them in the same spot! This aspect shows just how precarious its location is, over looking the Gorges du Loup. It’s a very popular place for paragliding (second photo from the top shows this well). 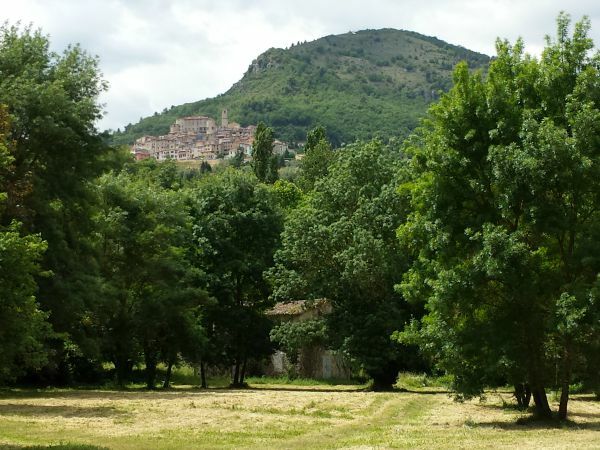 The hill village part of Châteauneuf de Grasse is hidden away from the road and easily missed despite being in quite a built up area only 4 kms from the city of Grasse. It’s a quiet residential place where you won’t find shops or cafés, just sleepy cats lazing in the sun. Every October it holds a festival dedicated to the humble pumpkin when the place comes alive but for the rest of the year it’s wonderfully tranquil and seemingly empty. I’ve written in more detail about the Fête de la Courge and Châteauneuf itself previously. 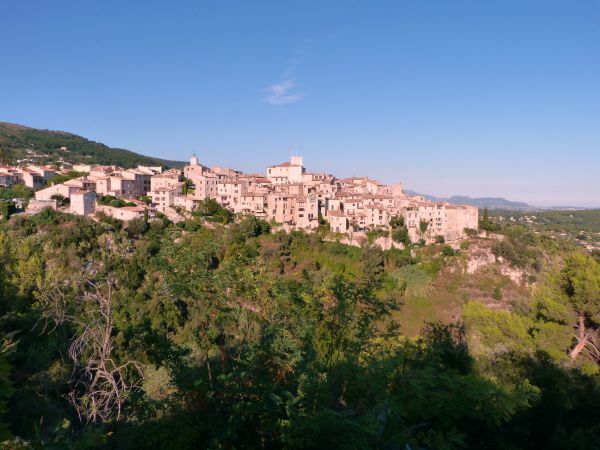 Le Bar sur Loup is one of the most picturesque and perfectly formed hill villages with a castle, keep and chapel popping out the top. You can see them in the photo above. Despite what many websites say about the village the tourist office is no longer in the keep but has been replaced by an excellent restaurant “le Donjon”. 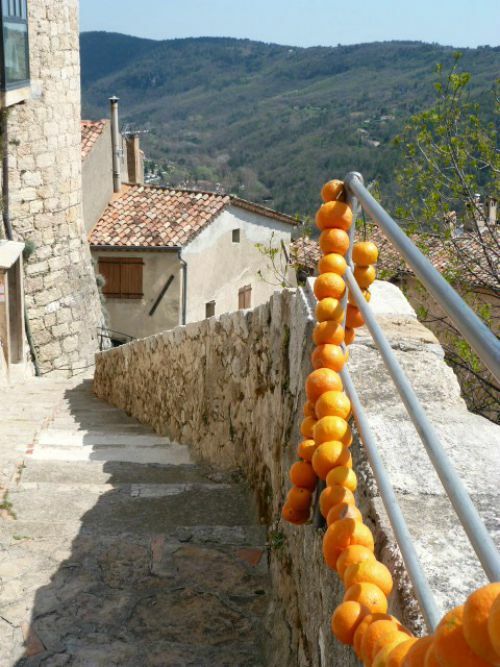 Le Bar sur Loup is known for its production of bitter oranges and celebrates them with a wonderfully fragrant fair every spring at la fête de l’oranger. A must if you are in the area at the time. Tourrettes sur Loup is famous for its violet production, grown for the perfume industry in Grasse and for crystallised candy and like many of these hill villages it celebrates its flowers with a festival in the spring. To get to the old part of the village from the central square (unfortunately a car park) you pass through an archway and enter the quiet alleys, where you’ll come across charming and unusual red houses amongst the stone buildings. For the best view of the village approach from the road from Grasse (rather than Vence). St Paul de Vence is probably the most well known of the Côte d’Azur hill villages owing to its association with some of the world’s greatest artists. Over the years names such as Picasso, Chagall, Matisse and many more have either lived here or been inspired by it. The town is the location for one of the best private modern art collections in the world, the Maeght Foundation, and nowadays is chock-a-block full of art galleries and studios. It’s an art lovers paradise and it’s exquisitely beautiful. The lanes are perfectly paved and every building is renovated and maintained to a high standard. The downside to this is that it gets very crowded. 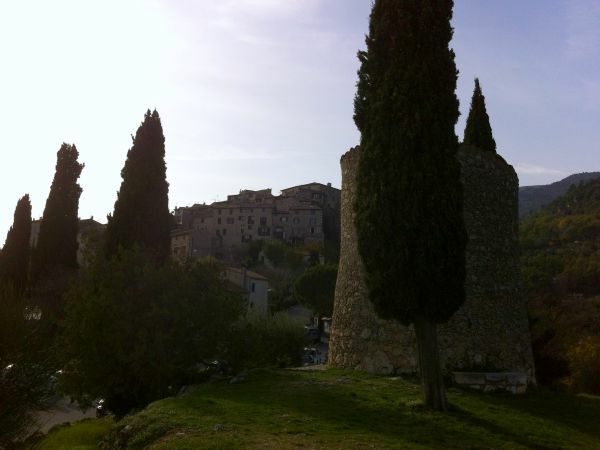 Take a look here for tips on how to avoid the crowds and more detail about the lovely St Paul de Vence. 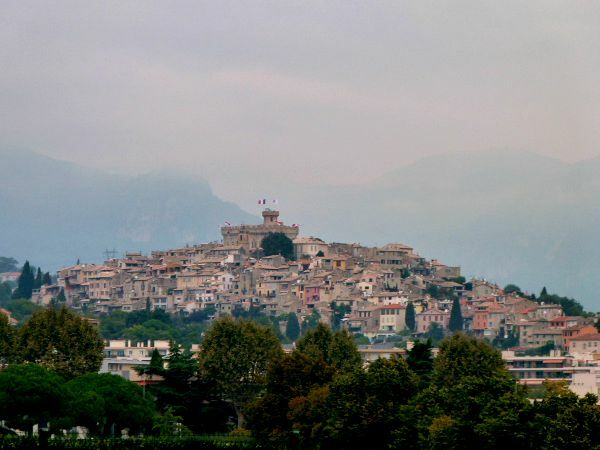 Hauts-de-Cagnes is slap bang in the middle of the conurbation of Cagnes sur Mer-Nice, is very easily reached by public transport from all over the Côte d’Azur and yet it is relatively unknown. Being in the centre of an urban area it is hard to get a good distant photo of it, with one of the best views being from the motorway! My shot above was taken on a gloomy day where you can just about make out the mountains behind; when you notice it peeking above the busy streets of Cagnes you realise it’s begging to be explored. 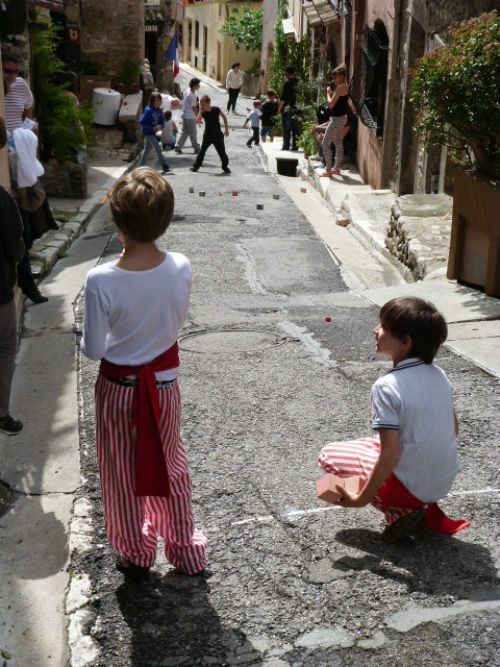 There’s a quirky fact about Haut-de-Cagnes, they play square boules “pétanque carrée” on the steep streets, the balls being square so they don’t roll downhill! 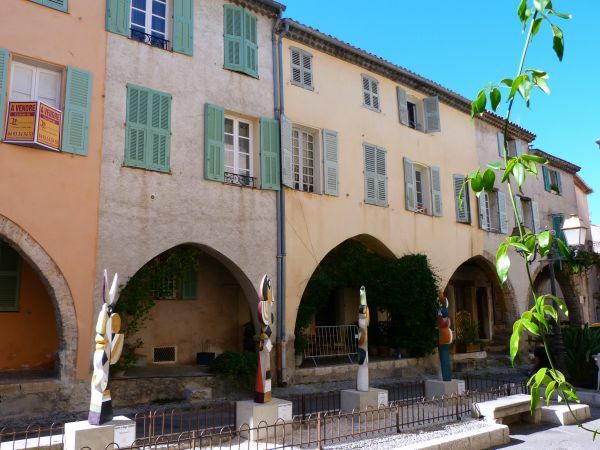 Biot is another of the hill villages which finds itself today as the historical and tourist centre of a much bigger but otherwise rather nondescript town. It’s small but very lively with plenty of restaurants, cafés, boutiques and art galleries. It holds a weekly market every Tuesday morning. 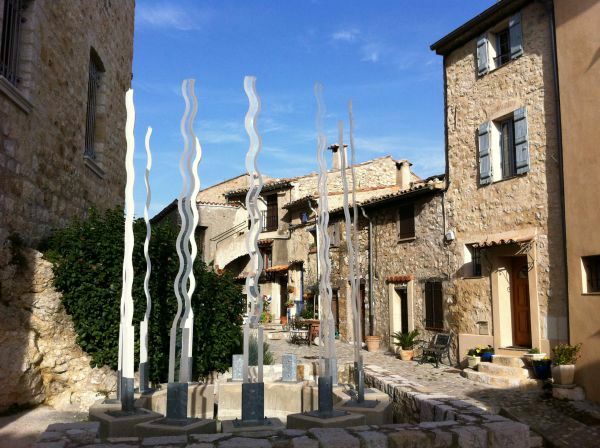 Biot is famous for its hand blown glass which you can see being made in a small workshop on the main street and in the bigger Verrerie de Biot just below the village on the main road to the coast. It is also well known for its very popular annual medieval festival every April. 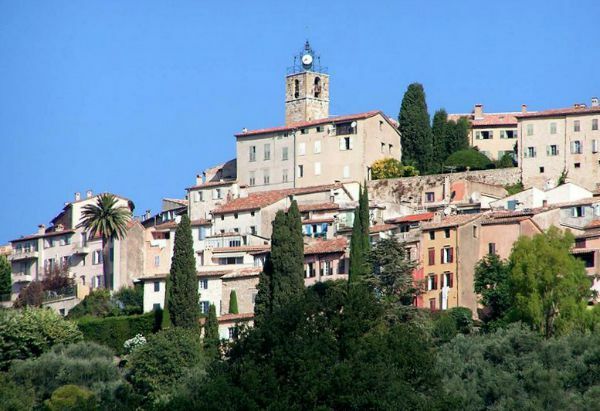 Mougins is located between Cannes and Grasse and rises in a spiral of streets from the plain around. Seen from above it is most unusual. 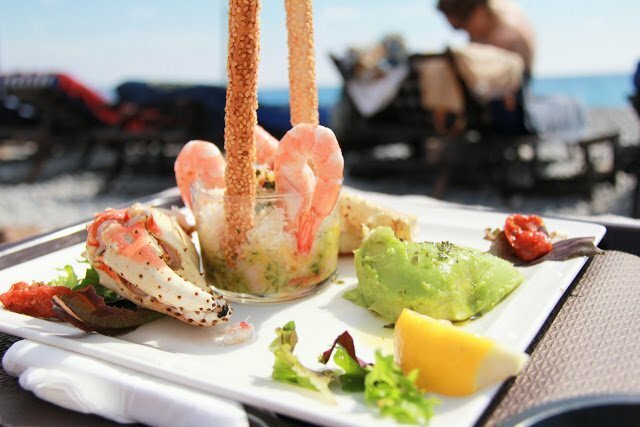 It has become known as a centre of gastronomy with many fabulous restaurants including some with Michelin stars and an annual food festival. It is also packed full of art galleries and the home of a small but good classical art museum. 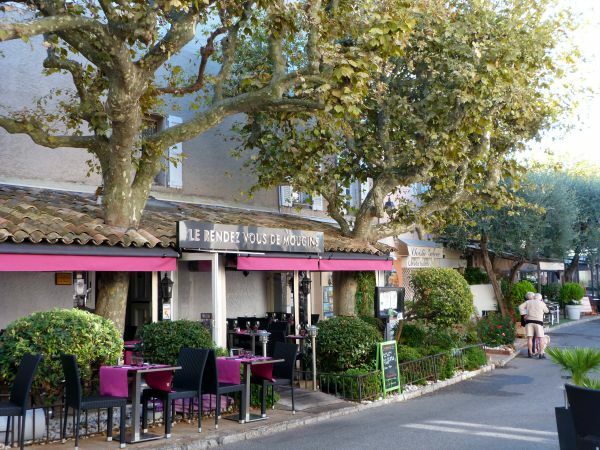 One of the most attractive aspects of Mougins village I think is the trees that grow through the restaurant terraces in the main square. Carros is a surprising stunner of a hill village, one that very few visitors ever see owing to the reputation of its namesake modern town. Modern Carros, built about 40-50 years ago is a hideous grouping of soulless apartment blocks and industrial buildings but go beyond this, a few kilometres up the hill and you’ll be well rewarded. 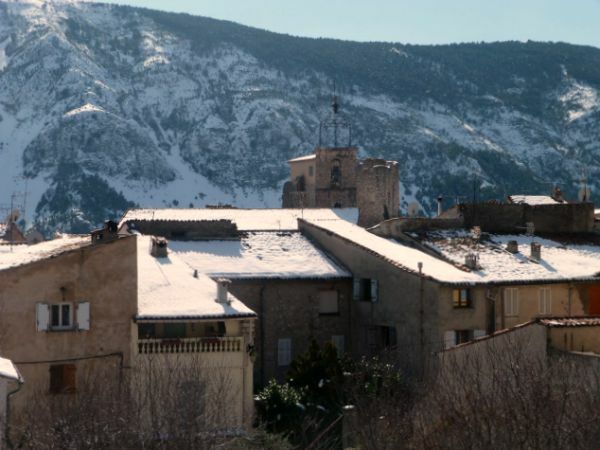 The views are some of my favourites of all the hill villages around, stretching up and down the Var river valley to snowy mountain peaks and the Mediterranean at Nice. The 12th century castle at the top of the village houses a rather unlikely International Centre of Contemporary Art and there are some interesting modern sculptures juxtaposed in the ancient streets. 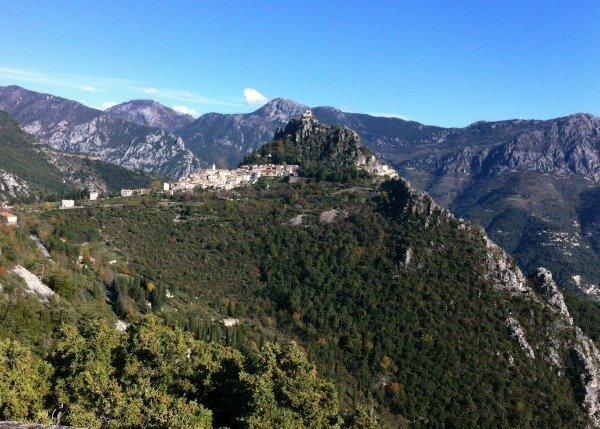 Peillon, as you can see from the beautiful photo above, sits in splendid isolation surrounded by forested mountains and valleys and yet it is only 12 kms north of Nice. It is tiny, peaceful, completely pedestrian and entirely empty of tourist tat and other commercial enterprises except for an unlikely secondhand clothes shop! At the top of the village next to the church you’ll find a panoramic map pointing out the nearby peaks and distant cities. Saorge is another completely untouched, in places run down, fully authentic hill village oozing charm and character. Looking out over the gorgeous Roya river its houses are built in about 5 layers up and up the steep mountain side meaning that the little lanes are often tunneled through the buildings. There are bridges and secret passages everywhere, cool and calm in the summer heat. I defy anyone not to fall in love with this gem of a perched village. 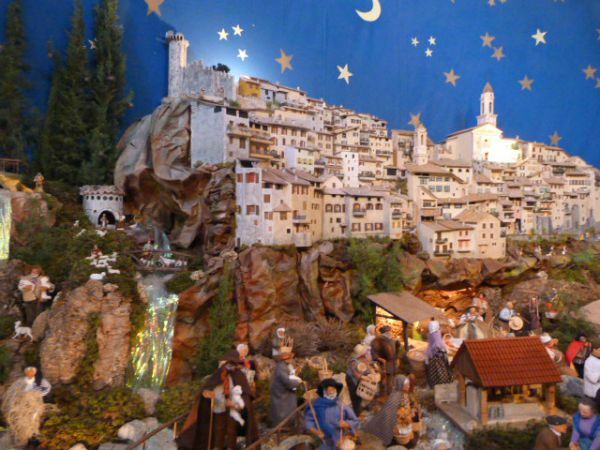 Lucéram is known as the Christmas village for during the month of December it comes alive with a “Circuit des Crèches”. Literally every tiny alley, every balcony, every doorway and every nook and cranny is decorated for Christmas with ribbons, baubles, tinsel, pine cones and santons, traditional Provencal clay figurines. The idea is to follow the circuit of Nativity creches (or cribs) around the village spotting the hidden ones and marvelling at the bigger scenes. The photo above is of a model of the village with santons, located in a room at the entrance to the village. Read more about this lovely tradition here. My advice for visiting hill villages is to explore the back alleys, get away from the main streets and lose yourself in the myriad of twisting dark lanes. Look out for interesting details and a sudden shaft of light. Breathe in the smells of the flowers in bloom or the damp odours of hundreds of years of history. Move away from the crowds and you’re sure to find yourself alone even in the most popular places. If you think you can’t visit these places with kids, think again. 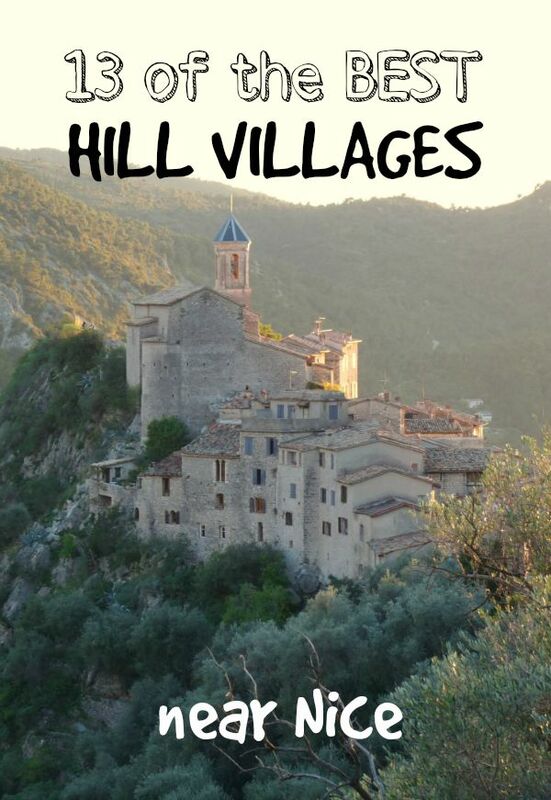 I’ve written about how to make visiting hill villages with children fun with plenty of advice and ideas based on experience. Above all make sure you visit at least a few of these gorgeous historical places while on the French Riviera, they are such an important and lovely part of its charm. Do you like my choice of 13 best hill villages near Nice? Have you been to any? Would you add any others to my list? ***Update Nov 2016*** I have written about another gorgeous hill village nearby which had I visited before I wrote this, I definitely would have included it in this list. Take a look at Sainte Agnès here. 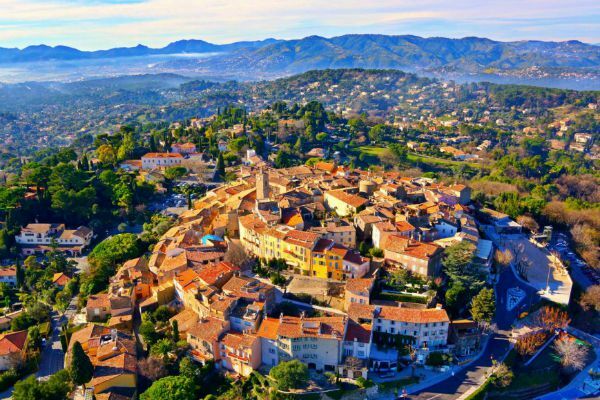 Photo credits: thanks to From the Riviera to the smog for the beautiful photo of Peillon at sunset (shown twice), Christophe Jacquet for the first picture of Châteauneuf, ALK3R Blog for the first photo of Mougins, Jim magic for the first photo of Eze. Thank you for your most informative blog outlining all these hilltop villages. Never knew about them and we leave this week go a month in Eze sur mer. So much more to sea plus all the coastal towns! Hi Peter, thanks for your comment. I suppose I didn’t include Mandelieu mainly because I don’t consider it a “hill village”, for me it’s a coastal town, and also because honestly there are so many fabulous places around I couldn’t possibly list them all. I had to make a cut off somewhere! Thanks for the great info. Just wondering why you did not include Mandelieu La Napoule with its stunning views, laid back lifestyle and great hike areas. I’m sorry, your comment got over looked and it’s probably too late now to reply, but I wouldn’t really have been able to help you anyway as all the villages around here have fêtes of sorts. I hope you got to visit a few more this time. Mougins is my favourite! Thank you for a great informative article! Thank you for this, visited the area 9 years ago and always wanted to return. 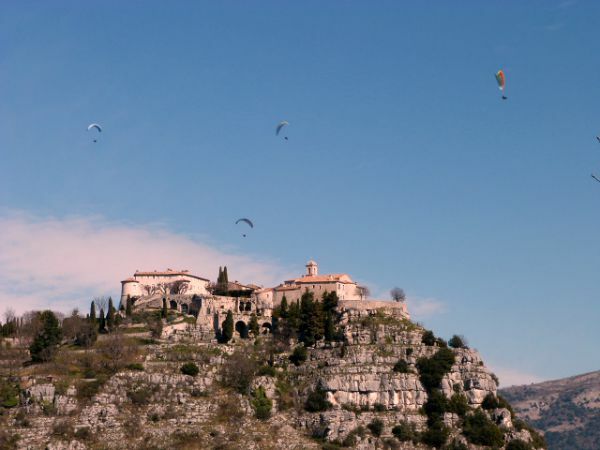 Staying in Vence later this month and hope to see more of the hill top villages. Last time we visited there was a hill top village which had an evening fete but can not remember the name of it? I have been in 5 of the villages in the list. We loved your post, and went to some of your suggestions during our trip in April! Wonderful page! I’m so glad I found your site. This is a great resource. I am planning a “girls” trip for 16 friends in late September 2017 based in Nice. We are all artists, so I’ve been leaning toward visiting St. Paul. I am thinking we will take the bus from Nice early in the day, and mid-week. Do you have any sense of how difficult it may be to get all of us on a bus home in the mid to late afternoon? I know Eze is also accessible by bus. Are any of these other towns on bus routes? Phoebe this was such a great blog on Hilltop Towns that you posted, and I’ll have you know, we managed to visit all but a couple on your list. I am into photography, and all were a photographer’s dream. We have been to Nice and the Cote d’Azur before, but this time we were interested in getting of the beaten track. The bonus was that we are here off-season so we had no crowds to contend with. Thank you for the great suggestions. I shot over 1,500 photos in these beautiful medieval towns. I am happy! We return home tomorrow but I know that we will be back! It’s one of the things that makes this area extra special Lolo, I hope you get here one day. Saorge is an absolute gem Clare, you must come and visit it one day. Some of them are more vertiginous than others but yes, they really do perch! Gosh, they really do perch! Not an area I know, but one that you have inspired me to check out. Hi Bill, I don’t think absolutely all are easily accessible by bus (Peillon and Gréolières would be difficult for example) but most are. Eze, St Paul, le Bar sur Loup, Châteauneuf, Tourettes sur Loup, are all fairly easy to get to. Saorge can be reached by train with a bit of a hike at the end and I think there’s a bus to Gourdon, but none of the buses are that frequent. Buses are very cheap and easy to work out if you read a bit of French otherwise more tricky. This is the website you need to find all the different routes. https://www.departement06.fr/vous-deplacer-en-bus/lignes-et-horaires-3029.html To reallyget the most out of these lovely places in limited time I recommend a car. Are all of these accessible by bus? Or do most require a car? Are the buses relatively easy to figure out and use? Hi Kristina, there are definitely places to rent a scooter, just google it (in French “location de scooter”) but as for bikes in the villages it’s not possible as they are all too small and steep to cycle around (and are pedestrian only). On a scooter you could visit several in one day, they are so small you really don’t need to spend a whole day in one. I hope you enjoy your time here, the hill villages really are special. I am planning my second trip to Nice, and am looking for more “countryside” exploring this time around – your post is very helpful! Last year I went to Nice in early Sept and really enjoyed the town – also went to Monaco for a day. I don’t think I’ll spend all that much time in Nice this visit – I more wanted to see St. Paul, Eze, and maybe one other village. Do you know if it’s possible to rent a motorbike/vespa to travel around? Or once in these towns is it possible to rent a bicycle to get around within the town for the day? I’m a solo traveler looking for a relaxing few days of exploration. I never tire of visiting these villages and there are so many that I haven’t been to yet still to explore. Thanks 🙂 There are plenty more than just these ones too! I can’t imagine being disappointed by Eze, did you go up to the gardens at the top? There are so many more than just the ones on this list, I hope you get to see some more one day. What a touching comment EE, thanks for sharing this special memory of you mother. I hope you come over this way some day soon and we can meet. Simply stunning. I have not been to any of these but the rest of my family have. It was the last holiday my father and sister took with my mother before she died and they got to about half of these. She was very sick although we did not know and I treasure the photographs I have of their time there and I think she might have enjoyed some of the visits even though she was tired, she is certainly smiling in some of the photographs. Carros, Peillon, Saorge and I quite fancy watching the square boules of Haut-de-Cagnes. What a fabulous post. 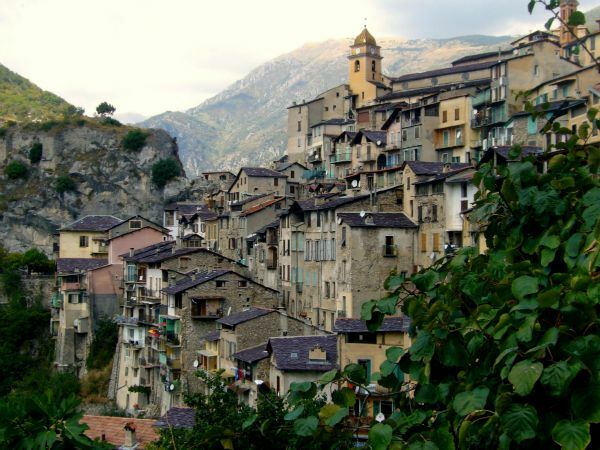 Never knew about these little villages and now I wanna see them! Hi Lindsey, yes you can visit several in a day if you plan your route well, but you would need a car to do that. 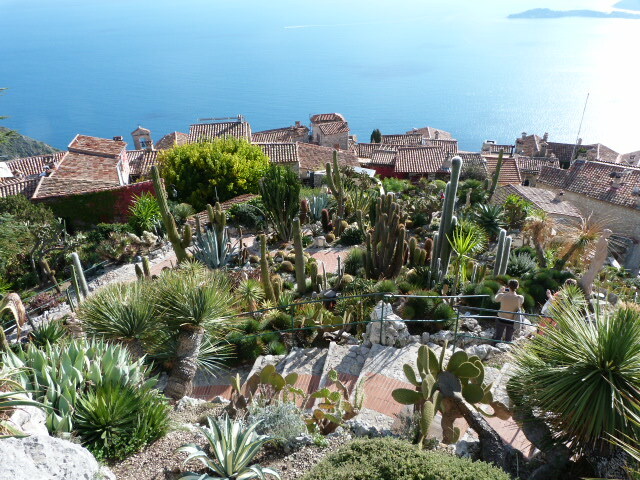 Without your own car from Nice you could visit Haut-de-Cagnes and St Paul easily by bus. With a car you could do a circuit like St Paul, Tourrettes, Bar s/loup, Gordon and even Châteauneuf in one big full on day. Or you could visit Peillon and Saorge in one day. For a varied day to see as much as possible I would suggest the St Paul to Châteauneuf route (but it does depend on where you are staying as a starting point). Can you visit more than one of these in one day? If so, what would you prefer? Do you need a car? Wow, great idea for a post! Really enjoyed reading and seeing all your stunning photos. All of these villages look quite amazing :). 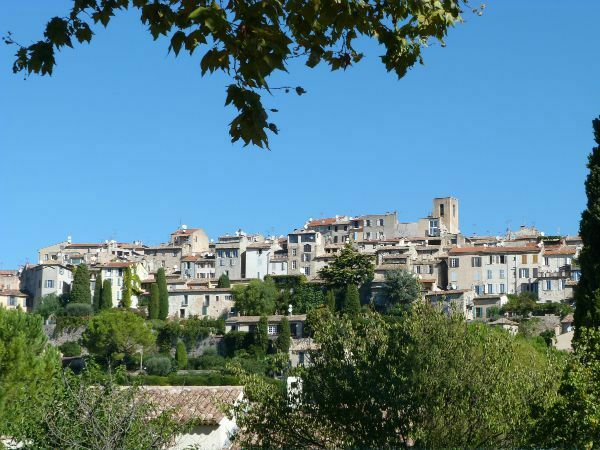 Vence is lovely but I don’t consider it a hill village, personally I feel the old bit is just the old part of a big town, unlike Haut-de-Cagnes which actually has a separate name and Mougins which stands quite separately from the modern sprawl. Surprisingly I’ve never actually been into the old bit of Opio, I must rectify that. It must be very different living in Nice after 11 years in sleepy Bar s/Loup. Thanks GGG,and I’ve never heard of Vézénobres which I’ll be sure to look up now that you mention it. OMGosh! Square boules??? I had never heard of that! I just visited Vézénobres today, and it was pretty fabulous as well although pretty sleepy in the off season. Love the post and the pictures! I lived in Bar sur Loup for 11 years, just moved three weeks ago to Nice. I’ve been to every one of the villages except for two. They are magnificent, beautiful, haunting and great fun. I recommend Gourdon, Tourettes, Vence, Greoliers, Biot, Chateauneuf in particular. You can also add Opio. This is one of the things I love about France (and travel in general) – finding lovely old villages and just wandering. Some of these look amazing. I’d LOVE to! But not an option sadly….hope you find a buyer soon! another fan of Saorge, thanks for commenting Marcello! Come and stay soon Allane! Amazing! These are exactly the kind of places I love to visit. It would be great to make a tour around these towns someday. Eze has always been on my bucket list, and I now certainly added Saorge too! Our charming 300 year old, village house is located in #7 on this list – come visit and buy a piece of history (totally renovated and ready to move into). Well I’ve been to all of these Clara and many times for most of them, and I’ve been to plenty others, but no I haven’t been to all the hundreds that are out there. 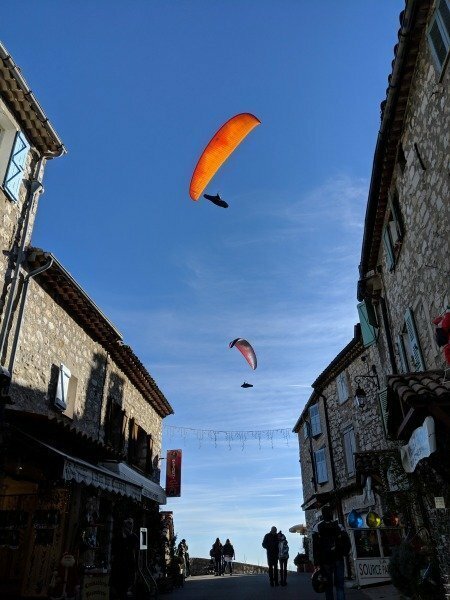 Next time you need a break from SA come paragliding at Lou Messugo!!! Great, I’m glad you found it helpful. Well they are 2 of the most beautiful so that’s a good start Tanja. You’ll definitely have to come back as there really is so much more to the C d’A than just the coast. I’ve made a list of where next to visit! Fabulous post!! I can’t believe in my month road trip around France that I didn’t even have time to get to the Cote d’Azur again. I’ve only been to Nice for 4 days, and from there I took the train to visit some towns/cities along the coast. This is a reminder that I need to get to that area again, and next time with a car, to explore some of these hill towns! 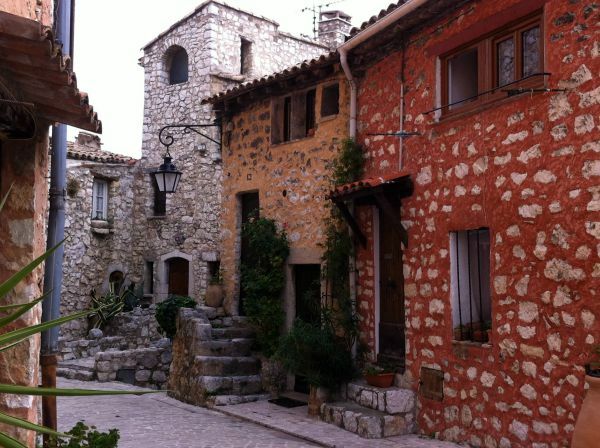 I’ve heard a few people rave about Eze, and your photos of Peillon and Saorge are just absolutely beautiful. Beautiful pictures! I am a countryside traveler as well, and definitely prefer these kinds of sights and environment. Will definitely keep this list handy. Thanks for sharing. Well who knew there were so many hill villages in the world let alone within such a small area 🙂 I had better not show my husband the paragliding picture, he’ll be off there. Have you been to them all? And I’ve only just touched the tip of the iceberg, there are literally hundreds! I hope you get back one day. If you get car sick on windy roads then it is a bit difficult to visit all these places. Some are not so high up though so you can get to them without suffering, like Mougins, St Paul, Haut-de-Cagnes and Biot. Maybe you’ll come back one day and give those ones a go. You must come back Christy and when you do I’ll show you around! I always get very alarmed when I have to reverse in the narrow steep lanes! I feel for you!! It’s great you’ve been to so many of these villages, and quite rare for a visitor to have seen so many. You were luck to see St Paul without the crowds. Definitey Margo, there’s so much to see in the area. Some are easy enough to get to by public transport if you don’t have a car. Hi Alex, thanks for your comment. I haven’t heard of Gorbio and I don’t know Roquebrune well enough to include it but I’m happy you’ve added them to the list and I’ll definitely check them out soon. Superb article! Would have loved to have seen Gorbio and Roquebrune included in your list but I guess you can’t cover them all. Well, I see that I have a lot of exploring to do! I’m in Nice, but I rarely get out to explore the nearby hilltowns – I’ll have to make more of an effort! 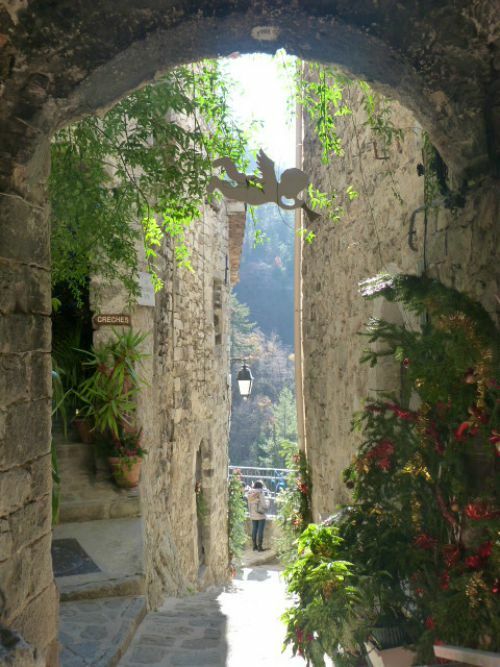 I have only been to Gourdon, Eze, TOURRETTES SUR LOUP and St Paul De Vence from this list and I absolutely love all these place! I have a special liking to St Paul De Vence though, Picasso everywhere and the fountains you will find at the end of each path. It wasn’t very crowded when we went but I imagine how bad it would’ve been if it is, the paths are too small for that I guess. These hill villages were probably my favourite part of France, I loved exploring them. And yes, we got stuck in our rental car down one of those tiny lanes and had to reverse it back up a ridiculously steep hill without hitting the walls! Great idea for a post, Phoebe! 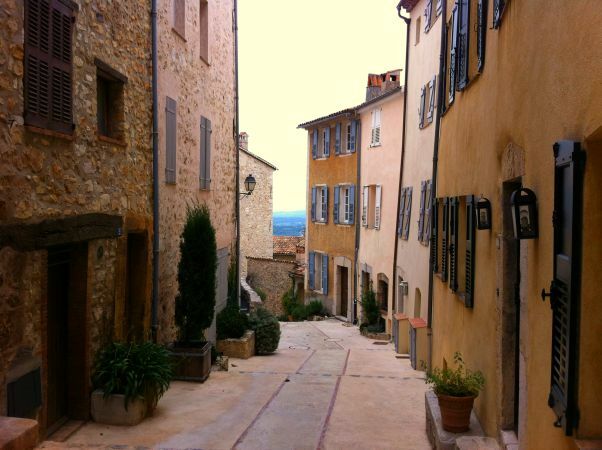 I think most of miss the hill towns on the Cote d’Azur because…the Cote d’Azur! But your photos and notes on each place demonstrate how much we’re really missing by skipping the hills! I’ve only ever heard of Mougins – because they have a volleyball club! Can’t wait to come back to the South of France, and thank you for showing it off over and over again! What beautiful villages! We did a drive in the hills once when we were visiting Nice. Unfortunately, I got so car sick with the twists and turns that I don’t remember much!! I think you’d love Saorge Richard, put it on your list for next time. That’s such a lovely thing to hear Brooke, I hope you get back to France for a holiday soon. Thanks for helping out with the explanation of the turtles! I remember the paintings Catherine, I’m glad this spurred you into wanting to come again! I’d love to say I have a drone or I went up in a helicopter Corinne, but no, I’m afraid it’s nothing as fun as that, a blogger called ALK3R kindly let me use his fabulous photo (link to his blog in the photo credits). 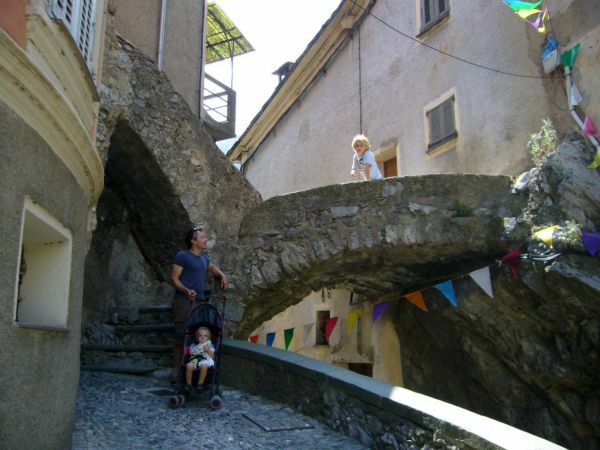 You’ve tempted me to revisit Lou Messugo in the not too distant future, like Catherine, when maybe we’ll see few more of these amazing villages. So far I’ve only been to a few of the more touristy ones. What wonderful photographs. We visited St Paul de Vence and we bought two lovely paintings. It is such a tempting place . We visited from Lou Messugo and we can’t wait to come again and to visit some of the hill villages that we haven’t been to. Such a great blog. Thank you for urging us to come again. Phoebe, I want to go to all of them! They are so pretty, especially in the evening light. Mougins is gorgeous. How did you get that view? Thanks again for linking up with us at #WkendTravelInspiration! Oh I wonder how you came close but didn’t visit? You’ll definitely have to come back again Melodie! Beautiful list of choices, Phoebe! 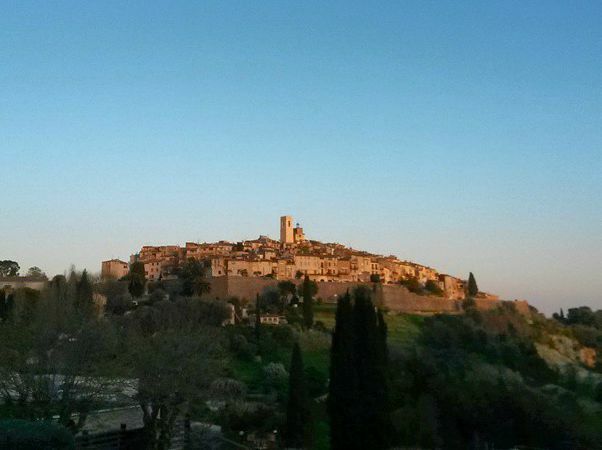 To answer one of your questions, I’ve only come CLOSE to St Paul de Vence, but alas ~ missed this jewel. Next trip to southeast France will now also have to include stops in Peillon ~ hopefully to score a sweet vintage piece in that secondhand shop! ~ and Saorge, with its purple rooftops and secret passages.